Scientists have announced that they are just 6 months away from producing in-vitro bio-sausages, a development that could revolutionize the summer barbecue. Mark Post of the Netherlands' Maastricht University is behind the research, which entails feeding horse fetal serum to pig stem cells to produce thin, tiny tissue strips. Bio-sausages and other in-vitro meats pose a compelling solution to the troubles of traditional cattle farms because these lab-grown meats only require muscle stem cells, which can be obtained without killing the animals. This opens up the possibilities to produce in-vitro meats from more than just livestock -- even cells from rare and exotic animals could be grown into bio-sausages and bio-burgers. 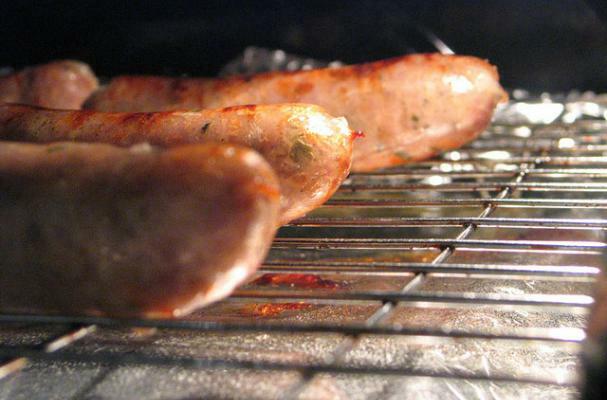 Would you pick in-vitro bio-sausages over traditional sausages? Do you support the meat-without-slaughter movement? No way would I eat lab grown meat. I am barely able to eat meat that I know is raised organically. This seems like one step away from Soylent Green. This is so cool. Yes I would eat it. Meat without slaughter and a way to feed more people. It's a win! win! There is NO WAY I would eat this!! Not that it would be labeled any differently on the package. This is scary stuff, probably another way to patent genes too. I would need to know how it tastes, part of the essential flavour of meat comes from the fat. If there's no fat does that mean no flavour? Ngaire- I don't believe eating animals is disgusting at all. I believe eating factory farmed animals that are pumped full of hormones and antibiotics and fed unsafe, unhealthy, GMO's is disgusting. That's why I choose to get my beef, chicken and pork from local farmers who don't use chemicals, don't spray their fields and they grass feed and pasture their animals. The animals are healthy and happy, which in turn makes me happy and healthy from eating them. I don't enjoy death, but I am very thankful to have good healthy food to eat, the way nature and/or god intended. These animals have only one bad experience on the farms, and it is their last one. I believe you can care for animals AND raise them for food at the same time. Their is a responsible way to it, or the factory farmed way. I know the food I eat was treated with love and kindness when it was alive. becuase I've met the family that raises it. I've often met the specific animals in life. I've seen them grazing and being milked, and I much prefer to eat that, than something a scientist is being paid by big pharmacy or the meat industry to tinker with in the lab. Something that no doubt would be put on the market, labeled long before any real testing had been done to prove or disprove its long term safety or health benefits or harmful side effects. s a vegan, this represents an interesting dilemma, as test tube meat could be a cruelty-free way of obtaining meat. However, due to the significant amount of animal testing the likely occured to bring this product to market, I doubt many vegans would consider eating it.